The Amazing Mr Fish presents a circus, comedy, mime extravaganza. Not since the vaudevillians of yesteryear have so many skills been seen in one amazing show, and not even they could do it with a fish down their trousers. For the finale of the show Mr Fish rides a 10ft unicycle with one leg whilst balancing a gold fish on his foot! He then kicks the fish through the air so it lands in a gold fish bowl on his head, and yes his parents are proud. Sam Hryckow trained at the Ballarat Academy of Performing Arts graduating with a B.A. in performing arts in 1996 and a B.A. in English literature from Melbourne University in 1999. He has performed in theatre productions from `Hamlet' to `The Wizard of Oz'. After graduating Sam traveled to New Zealand and completed a Diploma in New Circus at Christchurch Poly-tech and was amongst the first intake at the National Institute of Circus Arts. 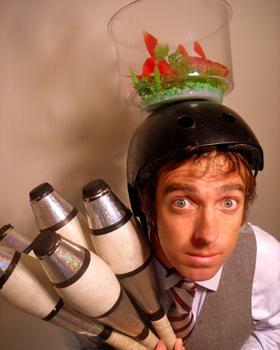 This lead to Sam performing live at Corporate Events, International Arts Festivals and along the way gaining the title of European Outdoor Entertainer of the Year with his circus comedy show. Sam was also nominated for the Scotsman Award at the Edinburgh Festival. In 2004 Sam performed the role of Pino Abrozetti in the coproduction of Hothouse Theatre and the Melbourne Theatre Company's `Second Childhood'. Sam has also appeared in television commercials and recorded numerous voice-overs. In 2005 Sam began a two-year contract with Circus Royal. In 2007 Sam appeared along side Magda Sabanzki in the Melbourne Theatre production of the Mad Woman of Chaiott. In March 2008 he once again joined the ranks of Melbourne's freelance performers. Don't miss the opportunity to book this exciting and innovative act.